Malting Farm should be on TV. Or at least in a well illustrated story book. It exudes such charm, colour and life that from the moment you arrive visitors can’t help but be enthralled. From its herd of Frisian dairy cows, to the wooden potting studio, it all has a typically English feel, while the stripy, painted front door screams ‘seaside’ even though you can’t quite see the sea. And, if it were on TV, Malting Farm would certainly be the antidote to The Only Way is Essex. Same county though it may be, this is a rural paradise so far from urban bustle that you could have flown a thousand miles. In short, it’s Essex at its very best. It’s beyond the farmhouse, though, that the very best of it is found. 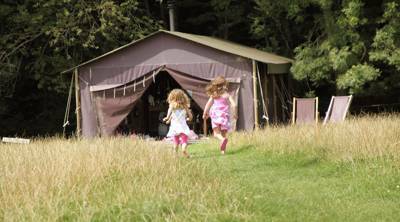 Here glamping guests can amble through long grass into their rustic-chic, safari tent abodes. Aptly described as ‘Canvas Lodges’ the tents sit at the end of a long, green field surrounded by ginormous oaks that have clearly been around for years. Partly tucked beneath their bows but with their fronts sticking out into the open space, the tents are kitted out inside with everything you could need for a self-catered getaway. There’s a master room, twin bedroom and large open-plan kitchen and living area, while some of the tents have plush en-suite facilities and an outside cooker out front on the wide, covered veranda. While these masterfully furnished lodges offer the highest spec of glamping, they’re still overshadowed by the joys of Malting Farm itself. Fourth generation owners Will and Sammy are friendly and helpful – providing a hands on tour of the farm where you can help move the cows and new-born calfs – and if you’d like to try your hand at pottery they’ll happily let you spin the wheel on courses they run in the studio. The real treasures, though, are the ones you find yourselves. Follow the clues dotted around that lead kids around the farms intriguing nature trail or borrow a net to try pond dipping, in a small, algae-speckled pool beyond the trees. If your luck dries up it’s just a couple of miles to the coast where you can try crabbing instead! However you chose to while away the hours, retreating back into the agricultural escape of Malting Farm is the perfect end to every day. Stock up on the farm’s own pork and beef in their honesty shop, fresh to slap on the barbeque, and sit out in the sun sipping a bottle of Adnam’s finest ale. Malting got its name from supplying the local breweries and still grows barley today – so really, it would just be rude not to! Canvas Frills Lodges include a double bed, bunk beds and a cosy cupboard bed. The lodge has an En-suite bathroom with shower and basin and flushing toilet. There is a kitchenette with outdoor cooker, and canvas covered veranda along with a living space area with sofas, a dining table and the like. 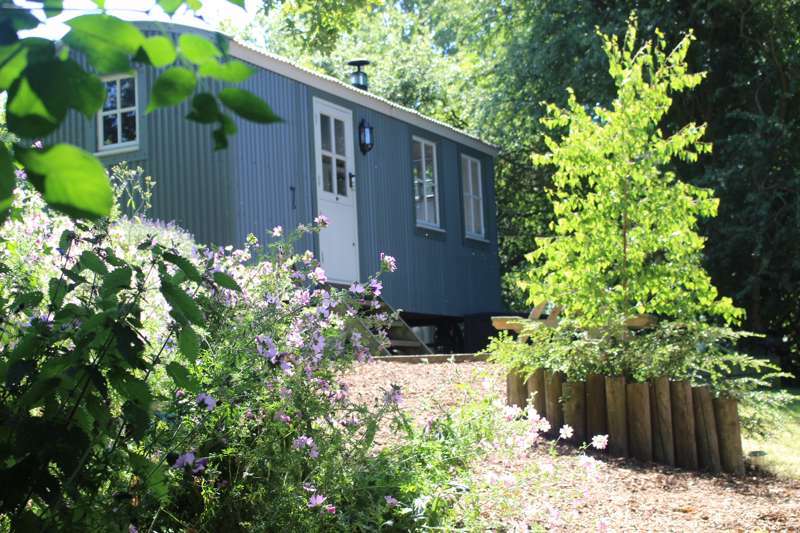 Standard Canvas Lodges are similar in style but do not feature en-suite bathroom facilities, a BBQ or large veranda. Wood is supplied for heating and cooking along with a starter pack of candles and lamp oil. Towels and bedding are all provided. Campers shouldn't pass up the opportunity to have a farm tour, there are 350 cows, lambs, kune kune pigs, chickens and quails and eggs can be collected fresh from a coup each morning. There's a nature trail around the farm, a tyre swing to play on, a small zip-wire and, a walk away, a small pond; plus the small potting studio for guests to visit. It's an easy drive to the Essex coast, home to some excellent beaches but more renowned for its fertile marshland. Hamford Water National Nature Reserve, near Walton-on-the-Naze is an excellent spot for wildlife watching, including a colony of seals that frequent the area, or drive north to the river Stour where RSPB Flatford Wildlife Garden (01206 391153) is well worth a visit. 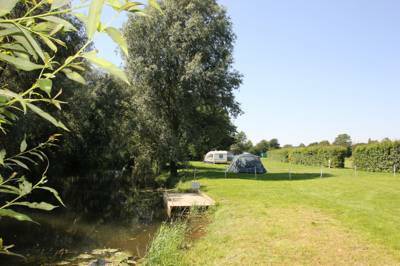 Flatford (01206 298260) itself is also host to a whole load of National Trust owned properties. The charming hamlet was the inspiration for some of John Constable's most famous pictures, for example, the Hay Wain or Boatbuilding near Flatford Mill among many others. Wander beside the River Stour or discover Flatford Mill and Willy Lotts House, quaint, old and as English as they come. Breakfast and local food hampers are available from the campsite at an extra charge and home made meals can be supplied (enquire in advance). There is a small honesty shop where you can buy the farms own produce along with some local goods (you can also buy pottery, jewellery and framed photos from the studio). There's also a wood-fired pizza oven onsite that is lit at least once a week (Will and Sammy can help show you how to use it). Pub-wise, the nearest are The Fat Goose (01255 870060) and The Bricklayers (01206 250405), both excellent and within walking distance! From £465 for a midweek low-season break, to £1225 for a week-long stay in high season.